Reea (pron Raya) travelled to Finland as a baby puppy in early 2009. 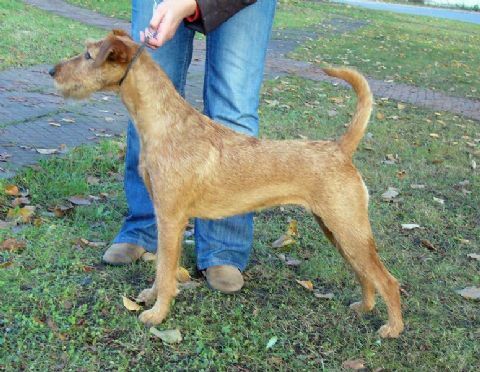 There she joined Ansku Linna and her other red heads at Devlish Irish Terriers. Produced using Breeders Assistant for Dogs Pedigree Software (tel: +44 1223 290291), Personal Edition licensed to Neridah Sharrett. Reea has been having a heap of fun in Finland, she enjoys shows, playing in the snow and has tried her paws at tracking and agility - showing that beauty and brains do go hand in hand. Check back here to see how Reea is going. You can contact her Mum Ansku by clicking here or by visiting her blog here.